This Post is Sponsored by Kay Jewelers. As always, all thoughts, words and opinions are my own. I only work with brands I use and love. We all know that diamonds are a girl’s best friend. I’ll be the first to admit, I LOVE diamonds, especially rings. With our 5 year wedding anniversary in April, we started talking about gifts a few months ago. We will be taking a trip to Florida, but we also want to get each other gifts. When we got engaged, my husband had just started a new job making $10/hr. Needless to say, he didn’t have the means to purchase an engagement ring that was very high quality. 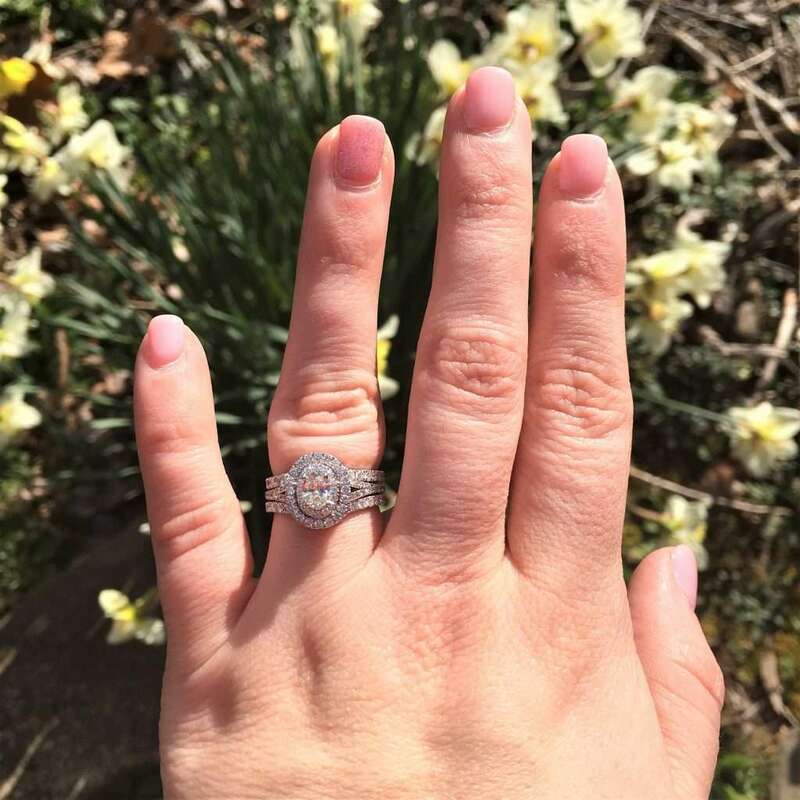 While I love the ring that he gave me and it is so special to me, we have talked for awhile about ‘upgrading’ my engagement ring and wedding band. He even told me years ago that he would ‘upgrade’ my rings on our 5 year anniversary! Knowing that this set will be my ‘forever’ set, we both wanted to make sure that we took into consideration all aspects of the purchase process and make an informed decision. 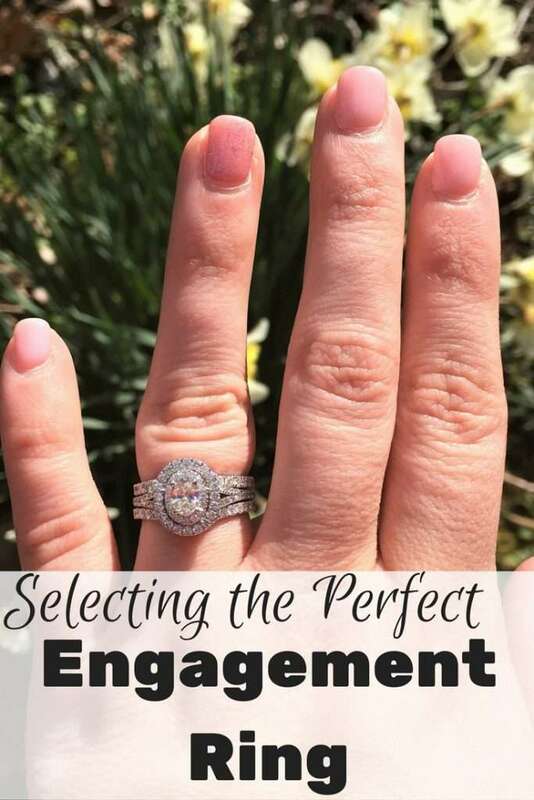 After going through this process, I have learned so much about purchasing the perfect engagement ring or bridal set and I am excited to share that with you today! Of course, this is one of the key points when shopping for an engagement ring or bridal set. Is it within your price range? There are all sorts of calculators out there as to what the ‘appropriate’ amount to spend is. Some people will tell you it’s one month’s salary, others will tell you it is a percentage of your yearly income. I am here to say this: spend what you are comfortable spending. We have worked hard and saved for awhile toward the upgrade of my bridal set. Understanding your budget and keeping that in mind during the purchase process is imperative. Tip: No matter your style or occasion, Kay Jeweler’s will work with you to ensure that you find the perfect ring and that it fits within your budget! Again, this is something that I didn’t know much about before I got married. My original engagement ring was 1/8 of a carat. As I said before, it is still gorgeous to me and so sentimental. However, I knew that for the upgrade, I wanted a larger stone. I knew that I wanted the total carat weight of the ring and band to be over 1 carat. Did you know that no two diamonds are alike? I had no idea! Most diamonds have inclusions, or markings in them. This affects the overall look of the diamond. This was something that I was very set on having a high rating in. 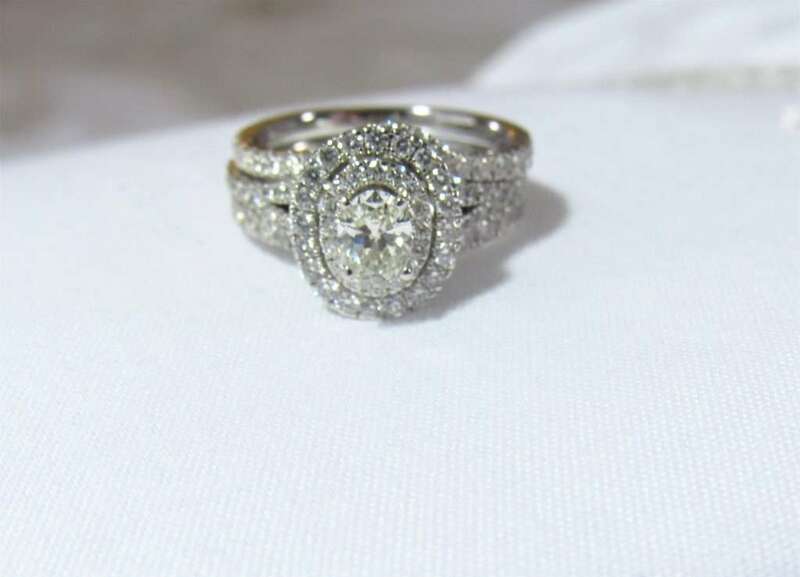 The ring that we selected has a color rating of I, which is one of the best color ratings in diamonds. I have always thought that cut referred to the shape of the diamond (oval, round, etc.). However, that is just one part to the cut of a diamond. The way that a diamond is cut is very important in the way that it looks-a great cut means that the diamond will pick up more light-giving you the ‘sparkle’ that we all love. Of course, when we talk about cut, it does also refer to the shape of the diamond. This was a difficult one for me to wrap my head around. The first time we visited a Kay Jewelers store to start shopping for rings and ‘see what is out there’, I wasn’t quite sure what shape I wanted. So, I tried them all on. The gentleman at the store, who was so kind and helpful, told me after I tried on about 15 rings, that I really liked the oval and round cuts. I was shocked! I really loved princess cut diamonds when I was shopping online. However, he was right-I kept going back to oval and round cut diamonds. Now, this isn’t one of the “4 C’s”, but it’s important when selecting an engagement ring! 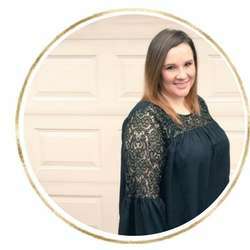 Whether you are a guy shopping for the surprise of your soon to be fiancee’s life, or if you are like us: shopping together, you need to consider the personality of the person wearing the ring. Are they flashy (if so, it’s ok! ), are they more minimalistic? Those traits need to be taken into consideration when shopping for a ring that will be worn everyday. Choose a Jeweler You Trust. For us, this was just as important as any other step or deciding factor in the process. Sure, there are online stores that sell engagement rings, or department stores…and even discount stores. 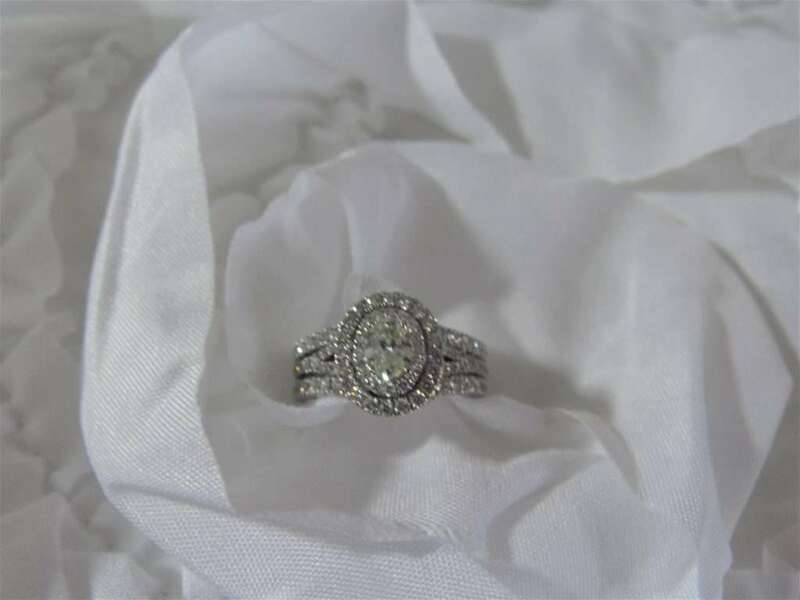 However, selecting a jeweler we trusted was imperative to us and it should be to you, also. After all, this is a piece of jewelry that will be worn everyday for decades to come. It will be an item that will be passed down to generations to come. You want to make sure you make an informed decision and have someone in your corner to guide you. For us, selecting a trustworthy jeweler was a ‘no brainer’. We have purchased items from Kay Jewelers for years, so when it came time to upgrade my set, we knew we were headed to our local Kay store. Throughout the process, we visited two different local Kay Jewelers stores and had amazing experiences at both of them. Each person that we spoke to was respectful. Respectful of our time, our budget and our wishes. This is HUGE in the shopping process. They listened to our needs, our budget and our ideas and helped us to make an informed decision. 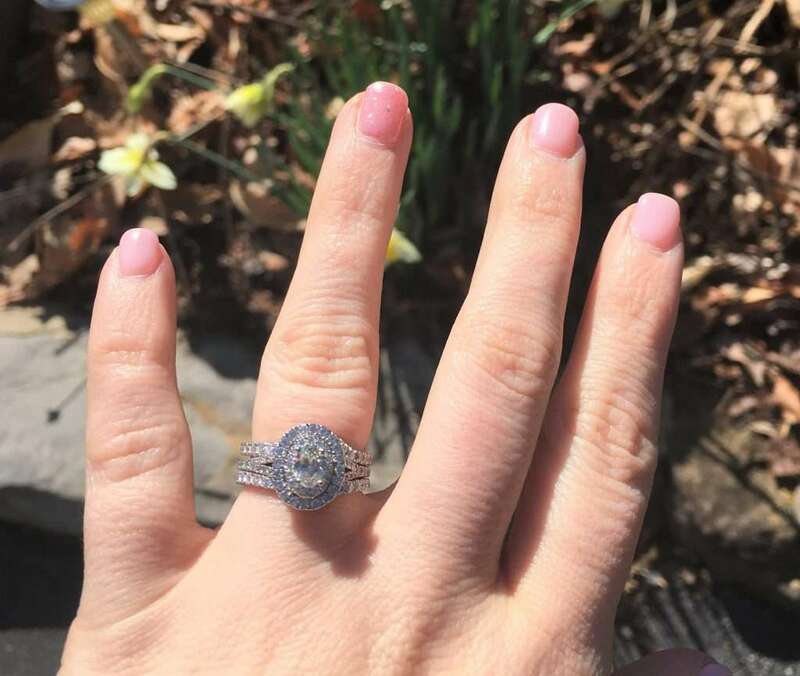 I truly cannot say enough amazing things about our experience with Kay Jewelers and I can’t wait to share more details with you about the selection process in a few weeks, including more details on my beautiful upgraded set! I totally understand! Thankfully, Kay Jewelers has a wide variety of rings for all lifestyles! What a beautiful ring! We didn’t have a Kay’s Jeweler’s around when I was picking out my engagement ring, but I wished we would have! That ring is stunning. I have a very unique engagement ring for two reasons 1) I am not a big fan of diamonds (on me) & 2) I hate yellow gold so my ring is pink sapphire and white gold. It is perfect for me. I bet that’s gorgeous! It’s all about selecting one that’s perfect for you. Thankfully, Kay Jewelers offers a great selection for everyone. Absolutely! It was worth the wait for sure. I remember years ago when my husband was ring shopping. We were so consumed with shopping for the cut, clarity and color. I even got a ring with a tiny black imperfection after all that research. There is so much research out there to be done for sure! I love the antique looking rings. I don’t know what it is, but they are just so beautiful! Your ring is beautiful! I remember shopping for my ring 10 years ago and I was very into the cut of the diamond. Was also into the vintage looks because it’s timeless. So many great tips and the clarity is so important. Thanks! I agree, the vintage look is so gorgeous! I’ve always loved my mom’s ring. It is an emerald cut diamond, which you don’t see very often. I’ve always wanted something that unique, especially since it’s also of high quality. Now I just need to find the guy who will want to buy something as special. I love the emerald cut as well! I tried on several at Kay Jewelers, they had so many gorgeous ones! It turned out just stunning! I love oval cut stones and yours is a beauty. Great tips for sure! As a photographer, I see so many stunning wedding rings and have been blessed enough to witness and photograph a few lovely proposals. I love macro-ring shots.. always some of my favorite from each wedding I shoot. This is all great advice! That’s so true, I bet you see all kinds of gorgeous rings! Every girl’s dream! I totally agree that diamonds are a girl’s best friend. I can still remember when I am about to get married. My eyes are always at my finger looking at my engagement ring. This is a great advice. I hope many Prince Charming could have time to read this. These are some great pieces of advice! Ring shopping is so much harder than most people think it would be and diamonds are so expensive, so you really have to shop around and take into account all the different aspects of stones. I’m lucky that I will be getting my forever ring the first time around, but that’s because my boyfriend’s mother is gifting him a diamond for it lol. That’s so true! How awesome that his mother is helping out-so special! These are great tips for people who are thinking of putting a ring on it! I think it’s important to consider things that your partner usually goes for in jewelry not to mention what style suits her the most. I love my ring. I am glad my husband took the time to learn all about the C’s. It is special to always wear a symbol of our love. I love your ring…it is gorgeous. love your rings! So pretty and that’s wonderful you were able to get an upgrade you love. I know lots of people who do this and it’s a great telling of how far you’ve come! As for me, I love minimalism in the design, and maximalism in the rock hahaha. My brother is having a plan getting an engagement ring for her girlfriend. He can’t get his mind straight, maybe because his nervous. It’s a very big deal for him, he loves her so much. But yep, it’s all about the personality of the girl. And I’m so glad and excited for them, helping my brother is the best thing because I can really does trust me so much. Anyways, this is such a big help and informative article. Thank you for sharing this! Cheers! Best wishes to him! Tell him to visit Kay Jewelers, they will help him for sure!